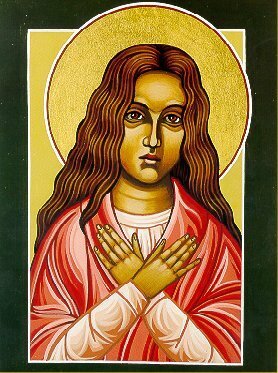 I you don't know the story of St Maria Goretti, you can find out about her at a site dedicated to her. The story of her life does not finish with her heroic death from stabbing by her aggressor. He went to prison and after some years of bitterness had a vision in which he saw her with an armful of lilies. As he took them, each became a white flame. There were fourteen, symbolising her forgiveness for the fourteen stab wounds he had inflicted on her. Later, Alessandro Serenelli was reconciled with her mother and they received Holy Communion together. She was canonised by Pope Pius XII as a martyr for chastity. Her words to her attacker were important in the cause of canonisation: "No, that is a sin. God forbids it and you would go to hell". When I was studying at Rome, I had the privilege of visiting the shrine of St Maria Goretti at Nettuno and attending Mass at the altar where she is entombed. The Church also has the statue of Our Lady of Ipswich. This was taken away for safety during the reformation but the ship foundered off Nettuno and the statue has been there ever since. I remember the visit also because at a local restaurant it was the first time I ate fresh octopus! PS. DilexitPrior has a lovely collection of prayers posted today, including "Prayer before a date" and "Prayer for sufferers from abuse".